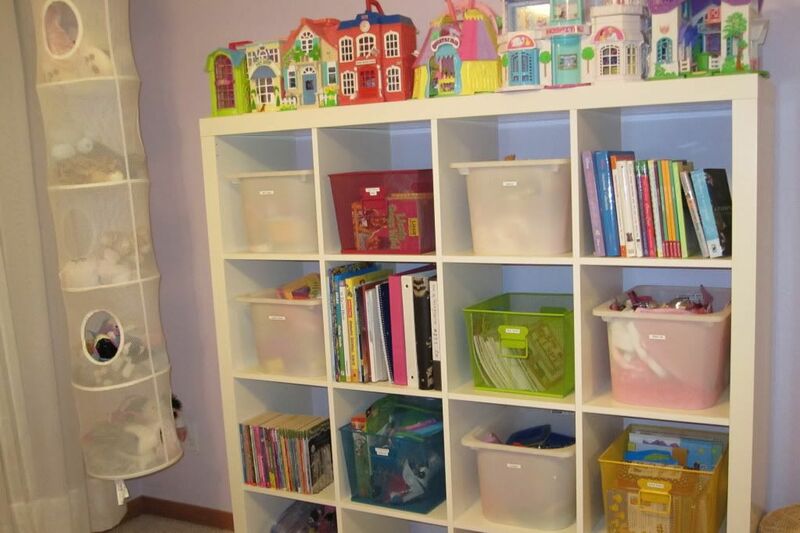 I've had several questions regarding my "Organizing Tips: Girl's Room" post. See here. Answer: The white cube shelf actually comes from IKEA. They have different colors and sizes also available. They have some similar at Target, but are generally online purchases only. You can find Pokey's shelving unit here. The only bummer about IKEA is that you generally have to purchase items in the stores, otherwise shipping is outrageous (generally a flat rate regardless of what you purchase). Plus all items are not available online. You can check for store locations here. Answer: Again, the drawer dividers were found at IKEA. I bought acouple packages (with a variety of sizes) and divided them up throughout all of her drawers. They come in a set of 6 and cost $9.99. You can find them here or check out photo here. Answer: There is no one perfect answer. I actually make scrapbook pages and put them in the end of my books since I do them by years chronologically. I also think a small scrapbook dedicated specifically to nothing but "christmas cards through the years" would be great way to store and enjoy them. You could display the book at christmas time each year. Keep it simple and make the card the focus. Answer: Pokey and Little Man both have boxes in their room. Every night when they bring home papers we sort through them and toss anything not important. If they want to keep papers, they put them in their box. At the end of the school year we spend an afternoon and sort through the box together. Waiting until the end makes it much easier to compare and prioritize things by order of importance. I let them decide things that they really want to keep. We have long underbed storage totes that seem to be the perfect size for over sized art projects. We also have a filing box for K-5 and 6-12. I have a large pocket filing folder for each grade. All of the items have to fit in that folder. If not, they have to go through the purging process again. I figure a few things from each grade is more than sufficent and it is also teaching them to not be hoarders. I also keep a filing box in the office for report cars, school pictures, and special awards K-5 and 6-12. I'll have to take some photos and do a post about it sometime. I do love IKEA from an organizing aspect. They have reasonably priced items in a variety of sizes and colors. Great organizing solutions. Most of the large items in Pokey's room come from IKEA: bed, dresser, desk, shelving unit, stuffed animal holder, and drawer organizers/white bins. The nearest IKEAs are located 4-5 hours away and consequently it is not always the most ideal. The shoe dividers, purple jewelry organizer, and cute baskets come from Target. They actually do offer some great organizing solutions at Target and also have amazing clearance deals. You have to keep your eyes pealed. They have killer deals on Toys, Sporting Goods, and clothing right now. You better hurry! !Unfortunately it would appear that the Global Bizarre is not happening this year, which is a total bummer. That is where I get much of my home goods once they hit 50-75% markdowns. I'm still hoping though. My sister and I were talking about the Container Store and Bed Bath & Beyond as other stores offering organizing supplies. I have purchased some items at both, but if you are on a budget they generally are a little pricier and don't offer good sales like Target. Spring Cleaning is a familiar term and when most people tend to do much of their organizing, but for some reason Jan and Feb are always the months I organize the most. Not only does it keep me busy, but something about it relaxes me and helps keep me sane through those gloomy months. I also think that watching "Hoarders" has kicked me into high gear. Do any of you watch that show? I think it's on A&E. I am addicted. I DVR it and watch it when I can. Something about it makes me keep going back for more. I feel so sad for these people and totally can't relate on any level (I've never had problems purging)... yet I find myself so intrigued and I just can't stop. If you haven't seen it yet, you should totally check it out. It might be just the incentive you need to get your life in order. I'm going to be working on my office and bedroom closet in the coming weeks. If there is something you have questions about, please feel free to leave me a comment or email me at lish@mchsi.com. I watch Hoarders. I'm fascinated by it. And I actually know a hoarder personally (although I've never been invited into their home). I think perhaps that's why I like to watch it- to try to understand those people. But I love intervention as well which comes on right before. Even made me want to use my psych degree to do chemical dependency treatment for a while. Good organizing tips---I'll try to remember the ones about school papers for when I have older kids. I'm looking around right now for some good filing cabinets because I get anxiety about loose papers for some reason. And my filing folders aren't cutting it anymore. Any tips or ideas on a good/not eye sore filing cabinet? Another idea I need...how do you store christmas cards?? Like ones you've sent out over the years. With the new photo ones I have no cute way to keep them. I just put them in a plastic sleeve that can go into a binder. (I also have one from wedding and baby) Any thoughts? Ok, thinking about your questions. But, I have one question for you. Are you referring to the xmas card you send people or the cards you get from friends/family (that one is tougher)? Are the wedding and baby cards from showers? Thanks for the tips. I will give it a try on the school papers. If you ever want free room and board out here, just give us let us know. We would love to have you.